Turret Forklift Certification, Learn to Drive a Turret Forklift! Many different types of equipment are used on worksites and in warehouses, from aerial lifts to forklift trucks to hand powered lifts. Each type of machine is designed for a different task to help improve the efficiency and productivity of the work site. One of these powered tools is the turret truck which is used by trained professionals with a turret forklift certification for indoor tasks. Check out our training courses and see how CertifyMe.net can get your entire workforce current and turret operators compliant with turret truck forklift. We’re the #1 option for turret forklift certification for companies all across the United States – find out why today! What is a Turret Truck? If you’re wondering, “what is a turret truck?” a turret truck is a counterbalanced forklift that carries pallets through narrow warehouse aisles. Turret forklifts are considered class 2 forklifts. The truck works off of an articulating base which rotates the forks 180 degrees while between storage aisles. Since the forks are able to move without the entire truck moving, the turret forklift is one of the best pieces of equipment for storing, lifting, lowering, and retrieving pallets within a warehouse. Turret forklift operators require the right blend of skills and safety knowledge to perform well on the job. With CertifyMe.net in your corner, you can get turret forklift certification. Our OSHA turret forklift training covers all the basic aspects of operating this unique type of lift – and once you’re done, you can become a turret forklift operator for any company in the United States! Where are Turret Forklifts Used? Turret forklifts are faster at handling pallets than narrow aisle trucks, help reduce operator error and related accidents, and allow for warehouse aisles to be placed closer together to increase the inventory. However, because of their specialized application of operating in such tight conditions, turret forklift certification and safety turret truck training is required. What Types of Jobs are Available with Turret Forklift Certification? If you employ turret operators, you’ll need to provide turret forklift certification. The key to running a turret forklift safety and effectively is the right training. Sign up for our forklift certification courses today. We offer turret forklift training, and many other types of powered industrial truck instruction, too! Why is Turret Forklift Training Important? In order for operators to be able to drive turret forklifts safely and take full advantage of their quick and efficient operating power, employees need to be trained with a turret forklift certification. Turret truck training teaches how to operate turret trucks safely, how to use them properly in warehouses, how to inspect the equipment and environment for any obstructions, and how to avoid accidents. CertifyMe.net is the preferred training partner for small, medium, and large companies everywhere. We’ve helped many companies train their turret operators. Don’t go another day without making sure your employees have the turret training they need! We also offer a complete assortment of forklift training courses for other types of powered industrial trucks as well! 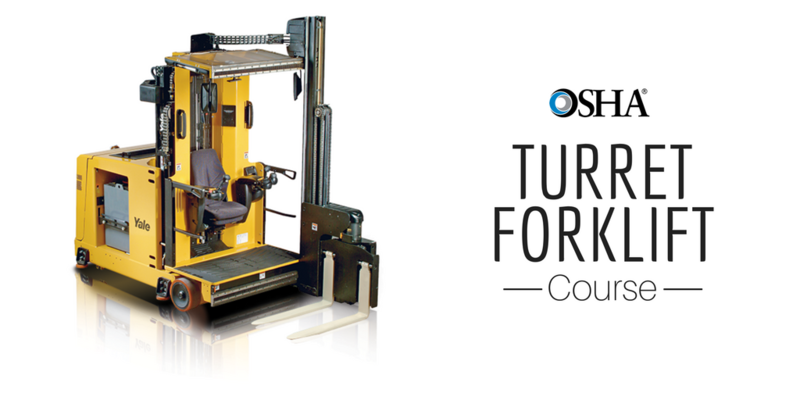 What Are OSHA’s Requirements for Turret Forklifts and Turret Truck Training? As the number one most effective way to prevent forklift-related accidents in the workplace, turret forklift training is an essential component for keeping you and your workers safe. OSHA recognizes the importance of turret truck training for turret forklift operators, and has created a few regulations regarding training to help reduce injuries and fatalities. According to OSHA, all employers are responsible for making sure workers are competent and able to operate the types of forklifts used in the workplace safely, following the successful completion of training. Training must be led by a qualified, experienced person in the workplace as long as it does not endanger other employees. • Training must cover truck-related topics, that include operating instructions and warnings, the differences between a truck and an automobile, truck controls, engine or motor operation, steering, maneuvering, vehicle capacity, visibility, and more. Training must also cover workplace-related topics, that include surface conditions, load handling and stacking, pedestrian traffic, navigating narrow aisles, hazards, driving in closed environments, and more. • Refresher training must be completed at least every three years, or as soon as an accident or near-miss occurs, or when a different type of forklift is being used in the workplace. CertifyMe.net offers an online turret truck forklift training program that covers Class 2 electric motor narrow aisle trucks, which includes turret forklifts, in addition to Class 1, 3, 4, 5, and 7 forklifts. For only $59.95, you can receive your turret forklift certification and qualify for new, exciting jobs. If you’re an employer, you only have to pay the $59.95 price once, and will have lifetime access to the training modules for your entire workplace at no additional costs. We even include three-year renewals for free! Click here and read our pallet jack training section to learn more about turret forklift training. CertifyMe.net is here to help with your turret forklift training and certification needs. Sign up today for training! For any questions related to turret operator training, give our OSHA forklift training experts today at 1-888-699-4800. Thanks for considering CertifyMe.net as your turret tuck forklift training source!